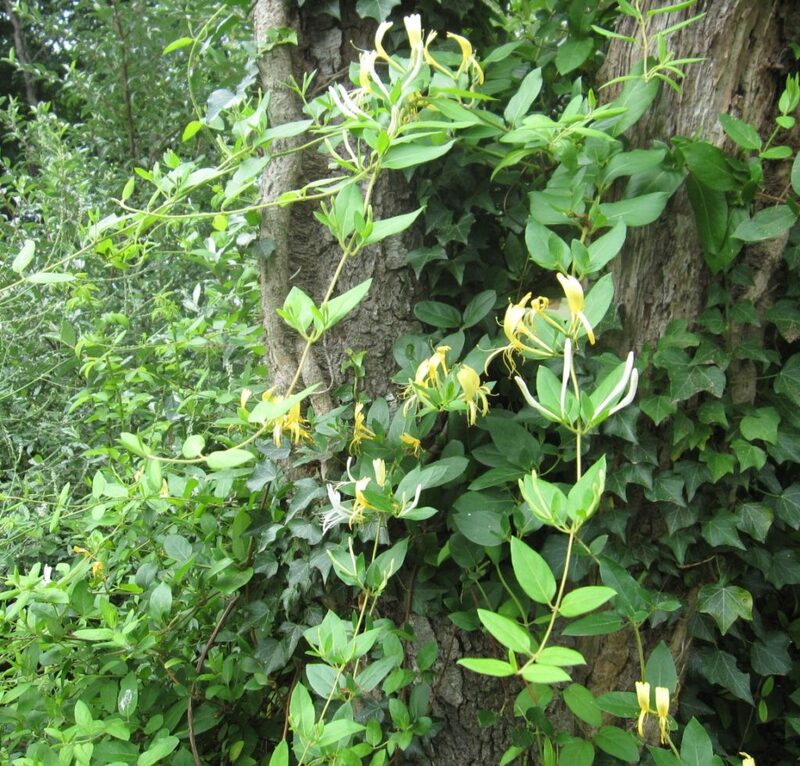 Japanese honeysuckle vine is a species typically found on Long Island. It has semi-evergreen, simple oval leaves between 1 and 3 inches long and about 1 inch wide. The flowers are double-tongued, opening white and fading to yellow, and sweetly vanilla scented; its fruit is a small black spherical berry containing a few seeds; vines have hollow piths; leaves are opposite with smooth margins; and stretchable stems reach out laterally from numerous root crowns. Native honeysuckle species are easily distinguished from the invasives. One native species, trumpet honeysuckle (Lonicera semperviens) bears red coral flowers and fruit at the ends of its stems, and the upper leaves of the stem are joined. American honeysuckle (L. Canadensis) has yellow, tubular flowers and bright red, twin berries. 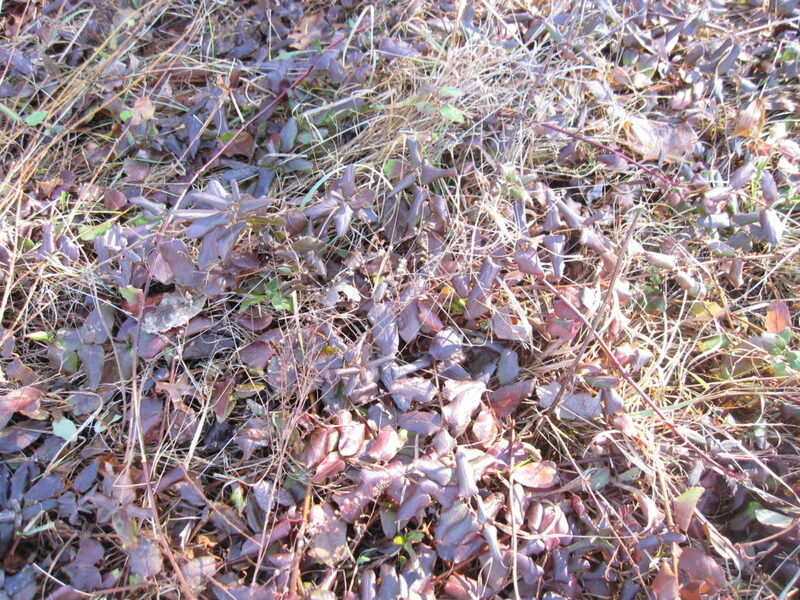 Mowing Japanese honeysuckle along the ground at the beginning and again at the end of summer can control this vine initially, but routine mowing increases plant density. 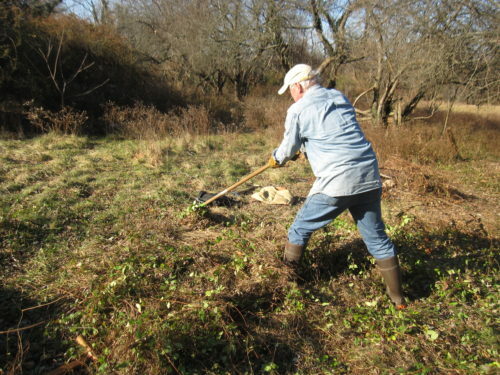 For complete removal do not mow, but instead: starting from the outer end, wearing rubberized gloves, hand pull seedlings; or lift long, stretchable stems with a steel rake or 4-prong cultivator, cut to the ground, and extract the small root crowns with large pliers when the soil is moist. Be sure to cut climbing vines to prevent them from smothering shrubs, trees and other plants. 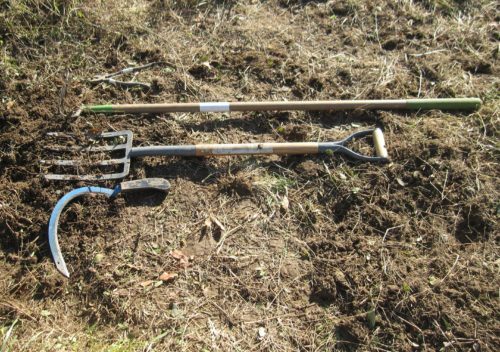 Start by clearing the area with a sickle or scythe, then loosen the soil and dig up the smaller roots with a spading fork, pronged cultivator and large pliers. A 4-pronged spading fork is the best tool by far. The roots are numerous and well-anchored in the soil. For larger root crowns use a Honeysuckle Popper or the mattock end of a Pulaski axe. 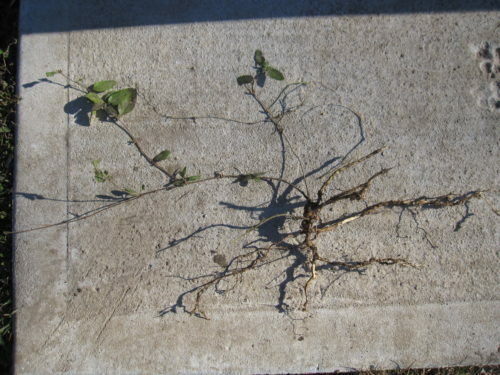 The best time to pull honeysuckle is in late fall, winter or early spring, early in the day or whenever the soil is damp but not frozen. Because these plants can re-root if left in contact with the soil, be sure to air dry vines and roots by leaving them on a cleared area covered with stapled black plastic sheeting. The plastic will also serve to smother out new growth if left in place for at least one growing season. Or, shake out the dirt, bag and dispose of stems, roots and berries. Then check for new growth.